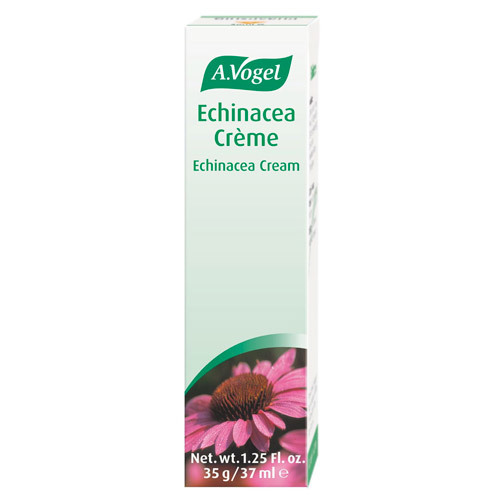 Echinacea cream can be used to help you maintain the condition of your skin. A good skin care regime is important – and this is especially so for anyone suffering from spots or acne. Washing the skin to cleanse and remove excess oil and unblock pores is an important part of daily routine, but this can leave the skin dry, sensitive and exposed to the elements. Try following up with Echinacea cream to protect clean skin and keep it in good condition – and in this way, help to keep spots and blemishes at bay. Echinacea cream is produced using extracts of freshly harvested, organically grown Echinacea purpurea herb and root, picked fresh and used within 24 hours of harvest. It also contains extracts of freshly harvested Wild Pansy. Aqua (Water),Helianthus Annus (Sunflower) Seed Oil, Echinacea Purpurea (Coneflower) Herb/Root Extract, Alcohol, PEG-8 Beeswax, Butyrospermum Parkii (Shea) Butter, Cetearyl Glucoside, Cetearyl Alcohol, Cl 75810 Chlorophyll (Melissa Officinalis Extract) Parfum (Fragrance), Linalool, Limonene. Echinacea cream may be used as often as needed. For external use only. Avoid contact with eyes. Contains peanut oil. 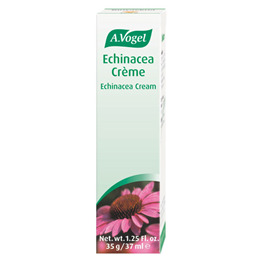 Below are reviews of A Vogel Echinacea Cream - 35g by bodykind customers. If you have tried this product we'd love to hear what you think so please leave a review. Echinacea cream can be used to help you maintain the condition of your skin. Try Echinacea cream to protect clean skin and keep it in good condition – and in this way, help to keep spots and blemishes at bay.